7.85 points at 20 votes (rank 117). 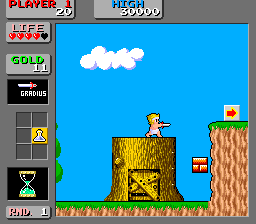 Eleven years have passed sind Tom-Tom, the Wonder Boy, has defeated the seven giants and rescued his girlfriend. 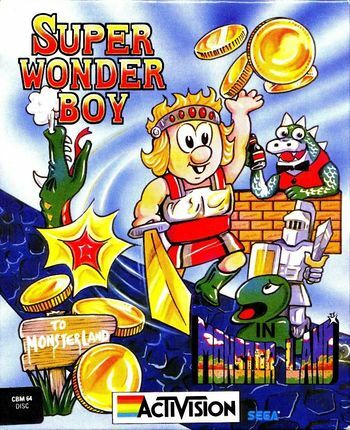 Now there is a new mission for our Wonder Boy: The Monster Land, home of many peaceful creatures, is in great danger. A dragon makes trouble and spreads fear, horror and terror. And as a high point to this all, the scaly beast has also kidnapped Tom-Tom's girlfriend. 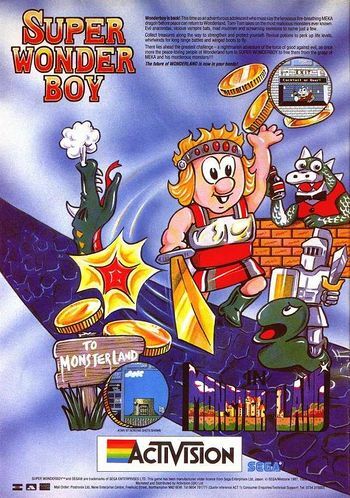 Well, being a hero is not easy, but fortunately, Tom-Tom is more than that, he is the Wonder Boy! And furthermore you have during your long quest the possiblity to go for a beer or a cocktail every few meters, this should sweeten the job a bit. There should be money to be found on the way to buy equipment and if all else fails, you still can visit a doctor. The game consists of twelve diversified levels. These are designed with many colours which creates a distinctive atmosphere. 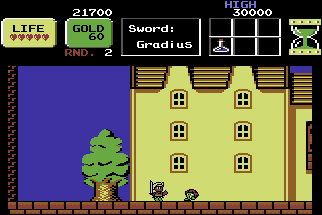 In several game test from 1989 and 1990, however, the graphics of the C64 conversion was mostly critized. 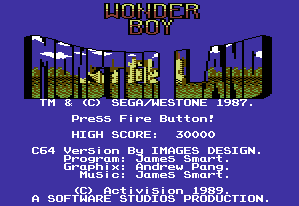 Wonderboy in Monsterland was supplied on a double-sided disk. 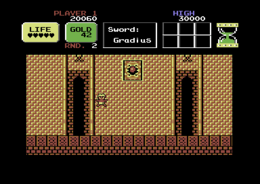 Next to dungeons, the hero has to fight his ways also through caves and woods, there is an underwater tour and the visit of many towns on the programme. For each level there is a time limit which can be elongated by buying or collection certain items. Defeated enemies drop next to money also valuable equipment. There are several of these bonuses hidden in each level, it is worth looking for money or secret passages! Apart from smaller problems when climbing ladders, the controls work very smoothly. Your progress cannot be saved. Walking mushrooms? Has SEGA stolen from Nintendo here? Level done! Has anybody expected anything else? The disk change needs to be confirmed with Space . Knocking back a drink in the pubs does not only heal life energy. You also learn a lot of interesting things from the gossipy innkeepers. Hourglass: raises the time left that you have to finish the round. Coin: raises the account balance a bit. Money bag: is much more gainful than coins. Small heart: gives a bit of life energy. Big heart: completely fills up the energy supply. Flying boots: make the hero glide through the air. Healing potion: automatically fills up the energy to full when it reaches zero. Magic cape: makes Tom-Tom invisible for some time. Glove: raises the power for several strikes. It then, unfortunately, breaks. Helm: catches a few hits before it breaks. 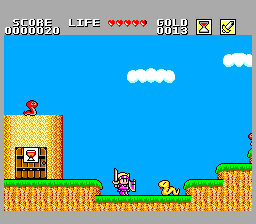 Magic and special weapons are a good support in the fight against the enemy. - Grenades: need to be used skillfully, of you want to land a hit with them. - Tornado: They dance on the ground for a while and can by this hit enemies several times. - Flash: hits all enemies in the room. - Fireball: flies towards the enemy. Boots raise the bounce depending on quality and price. - Cloth Shoes: cost 50 gold coins. - Leather Shoes: cost 80 gold coins. - Ceramic Shoes: cost 180 gold coins. - Legend Shoes: cost 380 gold coins. Shields are well suited to fend of arrows and projectiles. - Light Shield: costs 40 gold coins. - Knight Shield: costs 120 gold coins. - Hard Shield: costs 250 gold coins. - Legendary Shield: costs 360 gold coins. Armour - it does not need any explaining what this is used for. - Light Armor: costs 60 gold coins. - Heavy Armor: costs 100 gold coins. - Knight Armor: costs 150 gold coins. - Hard Armor: costs 360 gold coins. - Legend Armor: costs 540 gold coins. - Broad Sword: you can gain this in round 2. - Great Sword: can be gained in round 5. 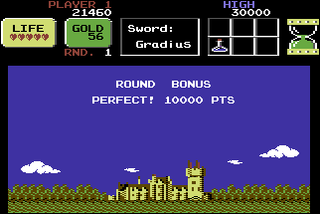 - Excalibur: In round 7 you can take possession of this masterly blade. NOTE: You can always receive only the next best sword. 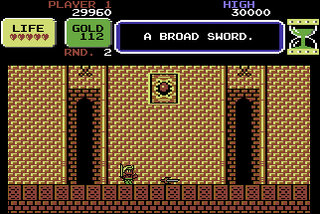 For example if you leave out the enemy in the second round, you get only the "Broad Sword" in round 5. 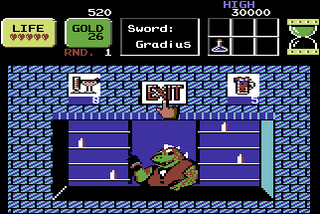 Key: You have to get keys several times in the course of the game, they are handy if you meet a locked door. Letter: In round 2 you have to find a hideout in a cave, there you will get the letter. Flute: In round 4 you have to follow the hint of a barkeeper and then swap the letter with the flute. Charm: If you play on the flute while being at the right place, you can discover a hideout in round 7. There you find a charm. Piece of jewellery: Show your charm to the big catfish in round 11 (other conversions round 10) and you will receive a nice piece of jewellery. In the same round you can find with this the bell or the ruby. Bell: a helpful item if you get lost in the labyrinth of the castle. Ruby: With this gem it is possible to find hidden or invisibile things. If you carry it when facing the end boss, you can save yourself a fight against a dragon. Many hints can already be found in the section "Hints" under "Questitems". The Sphinx asks Tom-Tom a riddle. - "Green Diamonds", answer "Baseball". - "Strange Glasses", answer "Missile Defense"
- "A Ride", answer "Afterburner"
- "Diet", answer "No Dinner"
- "Chicken", answer "Fried Chicken"
Alternatively you can get each correct answer from one of the barkeepers. 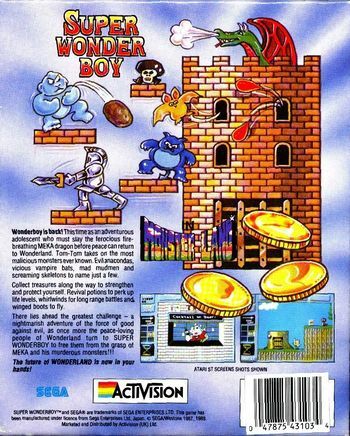 And if all else fails, Wonder Boy will have to face a difficult, but feasible fight. There is a series of cracked versions for this game. Most of them have a menu with trainer functions. 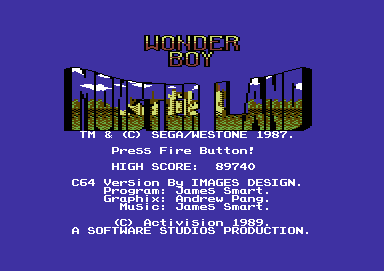 Amongst others have the groups Hooper, Mr. Fox, Nostalgia, The Anic Crew, Seven Eleven, X-Ray, Poltergeist, Contex, Century, Fairlight, Lotus, Transcom and Cracking Service pimped "Wonder Boy in Monsterland". At the CSdB there are several versions to choose from. The ASM compares C64 and Atari ST here. Shmendric: "A first class Jump&Run with diversified levels, partially tricky end bosses and only few unfair situations. Other conversion might have looked better, but the fun in the game was kept. No idea what all the nagging of the editors at that time was about, on the C64 you had as much fun as with the arcade machine." Guybrush: "Great game, which has not a too easy difficulty grade. I liked playing it. 9/10." Starkiller: "The graphical appearance on the C64 was not really a hit. If you compare it to other conversions it is really a turn-off. But otherwise there is nothing to moan, it stays a first-class platformer." 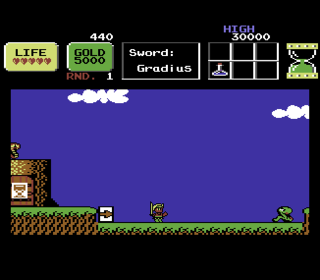 The original arcade version wasn't officially released in English despite finished localization. 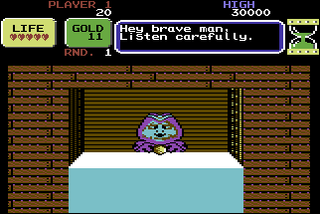 However, this translation was used in the C64 version and other computer versions released by Activision. Eventually in the 2012 the English arcade version was released for PlayStation 3, Xbox 360 and Wii on their respective download services. 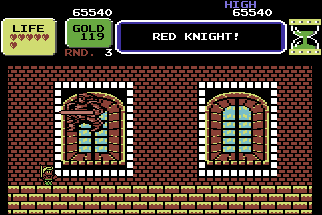 This release runs the original ROM of unreleased English version through software emulation. 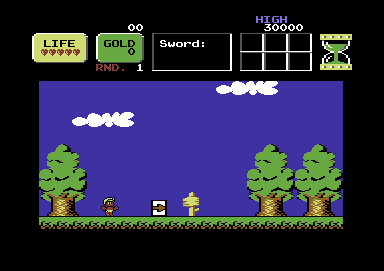 The arcade version was also released in German. This page was last modified on 9 August 2017, at 00:39.